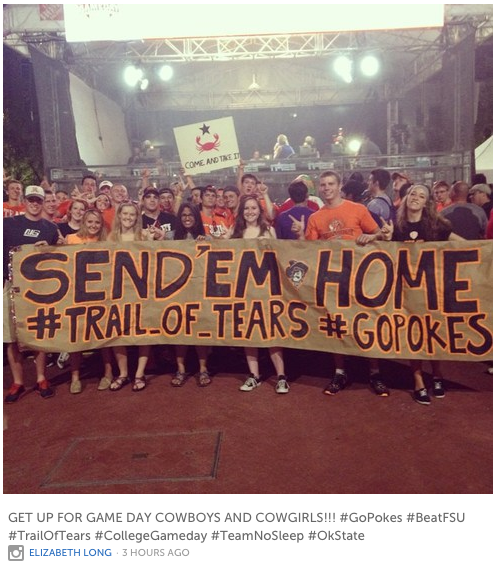 OSU to students: Trail of Tears sign not OKOklahoma State University officials say students' sign referencing the Trail of Tears at an ESPN event prior to the game against the Florida State Seminoles crossed the line. Oklahoma news outlets report the sign, held Saturday at ESPN's College GameDay event, read: "Send 'em home #Trail_of_Tears #GoPokes." OSU spokesman Gary Shutt says it is insensitive and the university does not condone it. The school's Twitter account says OSU "requested that it be removed." The Seminole Nation of Oklahoma did not immediately return a telephone call seeking comment. The Trail of Tears refers to the relocation of Native Americans from the southeastern U.S. in the 19th century, including members of the Cherokee, Muscogee, Seminole, Chickasaw and Choctaw nations now based in Oklahoma. Cherokee Chief Responds To OSU Student 'Trail Of Tears' Game Day SignThe incident took place on the Cherokee National Holiday where tribal members celebrate the signing of their constitution and commemorate the 175th anniversary of the Trail of Tears, the forced march from the Southeast to Oklahoma that killed thousands of Native Americans. Cherokee Nation Principal Chief Bill John Baker told News On 6 he'd seen the sign, but knows that their "good partners" at OSU will do their best to explain to students "how hurtful" the sign is in light of the tribe's heritage and history. "It's not going to ruin our holiday," he said. "We're trying to at least educate our state and other states as well so they truly understand, and we've got more work to do." He said, "It's particularly disappointing this unfortunate display happened the same weekend as Cherokee National Holiday, when we celebrate our resilience and ability to adapt and survive unimaginable circumstances. For months, we've also commemorated the 175th anniversary of the conclusion of the Trail of Tears. Since these students clearly don't understand the gravity of these events, this should be viewed as a teaching moment for these young people. We wish them well and hope they seek a more enlightened perspective. "Oklahoma State Fans Hold 'Trail of Tears' Banner for College GameDayInfluential sports blog Deadspin.com called it "one of the dumbest GameDay signs you'll ever see." The sign is concerning on a few levels. The Trail of Tears refers to the consequence of the Indian Removal Act of 1830: The forced relocation of American Indians from the southeastern United States to Indian Territory, a region which would later be known as Oklahoma. Between 1830 and 1837, some 46,000 Indians were removed, and many thousands died on the journey west. It's odd, to put it mildly, that Oklahoma State football fans in particular could create a sign (and it's not a small sign) that so casually treated a tragedy that is an integral part of their own state's history. According to 2010 statistics, Oklahoma State graduated the most Native American students of any college in the country, and its student body was 9.2% American Indian or Alaska Native. By Amelia Henderson“I am disappointed in the actions of these OSU students, even if these actions were unintentional, it is still a serious issue that must be addressed," said Larod Snyder, vice president of Phi Sigma Nu, a Native American fraternity at OSU. Snyder said it's important for students to understand the significance of the Trail of Tears and the cultural genocide of the Native American people. By Catherine SweeneyIs this still funny? Maybe if you are completely ignorant of the past. But guess what? These fans are students. In Oklahoma, American history is required in elementary school, in middle school, in high school and in college. Oklahoma State’s American history classes are packed with hundreds of students at a time. Professors lift the veil and let students know how despicably Americans treated the Indians. These people, smiling and holding up their pistols, don’t get to claim ignorance. No students at this school get to claim ignorance. By Erik Horne“My name is Austin Buchanan. I am a junior at Oklahoma State University, having transferred last spring. Today was my first football game as an OSU Cowboy, so I am obviously new to OSU’s game-day traditions. In my zeal to support the OSU Cowboys in their season opener against the Florida State Seminoles in Dallas today, my friends and I made a banner. I appeared in a picture with that banner, which I shared via my Twitter account. Included on our banner was a hashtag insensitively referencing the Trail of Tears. The Twitter post and picture were retweeted and shared by many, eventually going viral. “Though we did not set out to hurt or offend anyone when we made our banner, I see that it did just that. Referencing the Trail of Tears in such a flippant and disrespectful manner was insensitive and wrong, and I make no defense for our having had such a lapse in judgment. I apologize for our mistake. I am truly sorry. “To all Native Americans: I hope you can and will forgive me for diminishing a part of your history that should never be made light of. I pledge that I will invest diligent study reacquainting myself with the horrors of Trail of Tears so I don’t repeat the mistake I made today. He adds, “OSU needs to publicly identify each one of these students and deal with them in a harsh manner to send a message. Until they do, these kids are representatives of the school and its beliefs. To make a mockery of the Trail of Tears–especially on the anniversary of this genocide–is nothing but pure evil and an evil that must be extinguished.”And:Many natives across social media, but especially here in Oklahoma, believe that the only way to quell these acts of willful ignorance is for the offenders to be held responsible for their actions. An apology is not enough and is the reason that these kind of acts continue to happen. You can willfully engage in cultural appropriation and blatantly racist behavior towards Native American people and as long as you issue a faux-pology all is forgiven. There are no real consequences and there should be, especially in this case.And:I commend Oklahoma State University for their quick response to this issue and for recognizing the damaging nature of these students’ actions. I commend the student who issued the apology, although I cannot accept it. Until all the students involved are not only held accountable for their actions by the university, but are willing to accept and face the consequences of their actions…apologies are meaningless.Comment: Buchanan didn't claim ignorance of Trail of Tears or its significance. He said he was disrespectful, insensitive, and wrong. So the Natives saying Buchanan can't use ignorance as an excuse aren't quite hitting the mark. They're addressing a typical "faux-pology," not his actual apology. In any case, I'd say his apology was sufficient. He didn't use the usual weasel words to excuse himself from blame. He took responsibility like he was supposed to. Nobody says exactly what "consequences" the students should face. Maybe name the six or seven students holding the sign and publicly shame them? Give them or the entire student body a class on Native history. Send them to the Cherokee National Holiday at the school's expense? I wouldn't do anything more severe. I generally favor giving offenders a second chance. If they do something like this again, then you can punish them harshly. For more on the Trail of Tears, see Opponents Taunted with "Trail of Tears" Sign and Trail of Tears Basketball Tweet.